Day 16 of Round 2: Emily had clinic today and to our surprise Emily's counts are on the rise and she didn't need blood or platelet transfusions. And as a matter of fact her WBC is already starting to come up, where last time we sat neutrapenic for almost 2 weeks. Round 2 is nothing like Round 1 was at all, which does bring us a little bit of concern. This will be a quick update, because we have to be up early in the morning and be at the airport by 7AM for our early departure and hopefully the girls won't be fussy in the morning for having to get up so early. 3 hour plane ride and fussiness. HMMM. Off to Helen DeVos Children's Hospital in Grand Rapids, MI to stay at the Renucci House. I ask that you all say lots of love and thoughts to Connor and his family who is on hospice, but can't leave the hospital because they need to be able to control his pain. And also say lots of love and thoughts forMichael who is also on hospice. Neuroblastoma is such a horrible disease and so many children have lost their fight to NB in the recent, a cure really needs to be found. I will keep you all up to date on how things are. 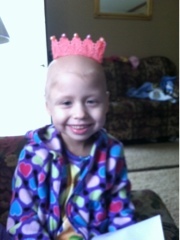 I normally do small updates on facebook -- https://www.facebook.com/emilysjourney -- but I will update here as well! Please keep Emily in your thoughts as she has scans for re-evaluation to see if we should continue this clinical trial that we are on. Make sure you love and kiss your kids and tell them how much you love them. Emily you look like a fairy tale princess! So beautiful!